40 - $161.99 Only 6 left! 42 - $161.99 Only 6 left! 44 - $161.99 Only 7 left! 46 - $161.99 Only 1 left! 48 - $161.99 Only 1 left! Want to sport a look that is both classy as well as nerdy? Well, that's kind of our bread and butter around these parts. We love to have fun but professionalism is always a priority for us. Sure, we have a break room full of TVs and video games but we know you have to work hard if you want to play hard. Although we are firm believers in having fun while you work. So, in that spirit, we’d like to introduce you to this Men’s Pacman Suit! Now you can go to work and show off your love for the classic arcade games or step into your local arcade as the classiest gamer in the joint. You could also toss on this fun vibrant suit for a night on the town. Hit up the bar scene or go clubbing with this slim-fitting suit on and you’ll be sure to attract the right kind of crowd. Anyone who doesn’t like Pacman is no friend of yours, remember that. 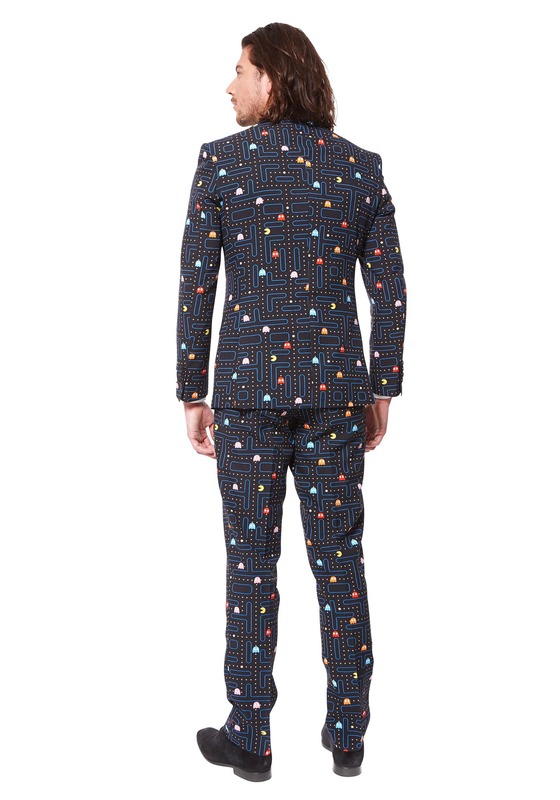 This awesome two-piece suit from Opposuits will make it look as if the world of Pacman has jumped out of the virtual world and into the real one. 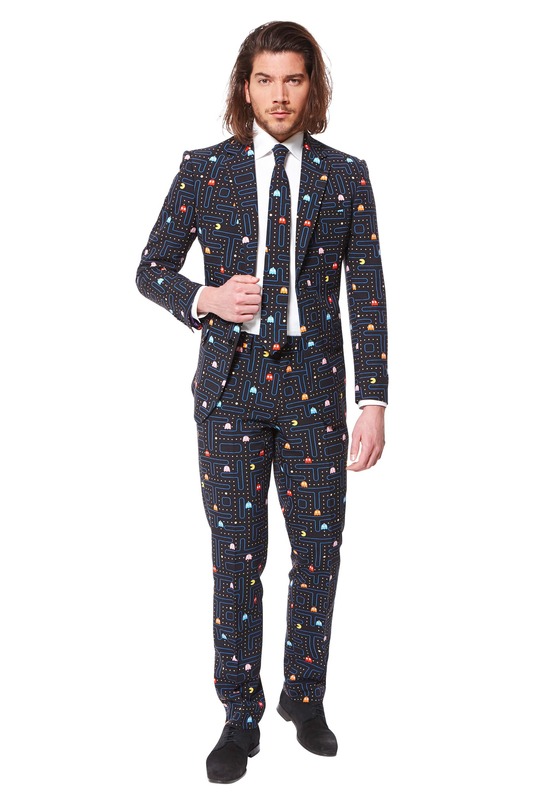 The jacket and pants are completely covered in a classic Pacman maze littered with pac-dots and the colorful ghosts we all know and hate to love, Blinky, Pinky, Inky, and Clyde. 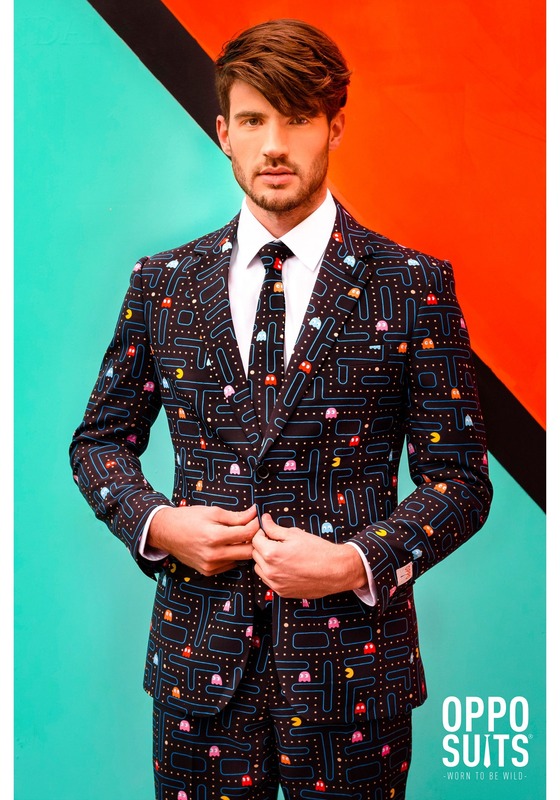 Then, of course, there are plenty of Pacmen printed up and down the suit to take care of those pesky ghosts. The included tie matches the rest of the two-piece and is also not a clip-on. So it’s time to finally learn how to tie a tie!